In this issue Welcome to this third issue of Re:action which showcases some of the fascinating research and enterprise activities taking place across the University. Please send us your feedback We are keen to receive feedback about Re:action. If you have any ideas, comments or suggestions, please send them to reaction@southampton.ac.uk. 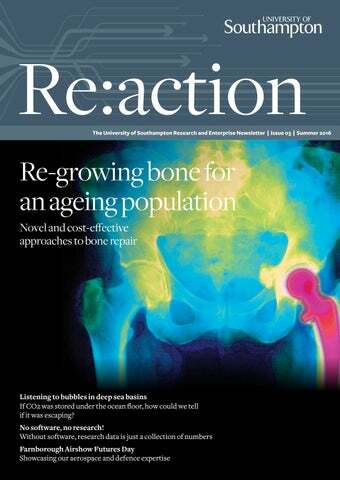 Re-growing bone for an ageing population Medical advances have led to a welcome increase in life expectancy. Indeed, it is estimated that by 2020, 20 per cent of us will be over 65. Medical advances have led to a welcome increase in life expectancy. Indeed, it is estimated that by 2020, 20 per cent of us will be over 65.
engineering strategies from the Group have been used to treat a number of patients. Among the challenges posed by our ageing population is the need for novel and cost-effective approaches to bone repair. With one in three women and one in five men at risk of osteoporotic fractures worldwide, the costs are significant, with bone fractures alone costing the European economy €17 billion and the US economy $20 billion annually. In 2014 Dunlop and Oreffo pioneered the first 3D-printed titanium hip-bone using a stem cell impaction bone graft for a clinical patient. Skeletal stem cell based therapies offer some of the most exciting and promising areas for bone disease treatment and bone regenerative medicine with significant enterprise potential. Listening to bubbles in deep sea basins Carbon capture and storage already happens. Carbon dioxide (CO2) is pumped into the empty spaces left when all available oil and gas has been extracted from land based oil and gas wells and marine aquifers. Carbon capture and storage already happens. Carbon dioxide (CO2) is pumped into the empty spaces left when all available oil and gas has been extracted from land based oil and gas wells and marine aquifers. But, if CO2 was stored in empty spaces under the ocean floor, how would we know if it was leaking out? How would we know it was there, how would it have reached the seawater from the sea bed, and how much was escaping? The world’s first ‘real-world’ deep water controlled experiment simulating such an emission from a submerged CO2 storage reservoir is due to start in 2019. The experiment will take place in the North Sea, 100km North East of Aberdeen, with advance development and testing taking place in 2017. The National Oceanography Centre is coordinating with the University of Southampton and other partners across the UK and Europe to run the project, which ultimately aims to further verify the safety of offshore CO2 capture and storage (CCS). But, in doing so, it also provides an incredibly exciting opportunity for partners to develop innovative technology and to establish the possibilities for ‘listening’ to deep sea basins. There is currently very little publically available data relating to the North Sea basin, especially to some of the geological features that may be important for CCS. Currently this type of measurement is hugely cost-prohibitive and would involve sending technology and equipment out to sea on a ship, at around £25,000 per day. The STEMM-CCS project aims to develop a system to detect and measure the volume of any CO2 released from underwater storage sites, and develop models and products that offer a good affordable baseline for this type of measurement. The team will develop acoustic and chemical sensors that will be fitted into auto-subs, alongside automated photographic analysis software to enable the detection of any visual changes at the site. These new technologies will be used in conjunction with off-the-shelf devices in the water and on the seabed to monitor changes in the chemistry, temperature, salinity and current of the water. from its aperture under the sea bed, which will slowly diffuse into the sediments and overlying seawater. The pipe will be hooked up to a lander which will be controlled by a remotely operated vehicle connected to the research ship on the surface. The research team includes acoustics and chemical experts who will use automated underwater vehicle (AUV) apparatus and video-guided water sampling equipment to measure the chemical and physical changes that might occur. Experts from Southampton’s Institute of Sound and Vibration will also be measuring the sound of any bubbles released and aim to measure the amount of gas released as well as look at the possibilities of identifying the gas in the bubbles. No software, no research! Funders are moving towards mandates to improve data management, which is great for the transparency and openness of research. But what about software? Itâ&#x20AC;&#x2122;s a vital part of research, because there can be no reproducibility without the software used to generate results. Funders have also made this connection, so it wonâ&#x20AC;&#x2122;t be long before software management plans are part of funding applications. If you want to stay ahead of the curve, now is a good time to review how you deal with your software. If data fuels research, then software is the engine that transforms it into something we want: results. Whereas data management ensures that your data is accessible and understandable in the future, software management (or software sustainability as it is generally known) ensures that the results of your research will be available too. It took years of campaigning to raise the importance of data. The campaign for software may have started later, but it is well under way and it’s collecting some important supporters including the BBSRC, EPSRC, ESRC and Wellcome Trust, to name a few. to bigger societal problems, like tackling some of incentives that, perversely, push researchers into dealing with software in the wrong way. There isn’t room to discuss these solutions in this short article, but there is plenty of information about the problems we face and their potential solutions. Fortunately, there are a number of groups who can help, such as the Software Sustainability Institute , based partly here in Southampton and funded by three research councils. The Institute works on a national scale, but a recent phenomenon means that you may also be able to find help locally. In the last couple of years we’ve seen the rapid growth of Research Software Groups. These groups provide software engineering expertise to researchers based at the same organisation. Researchers can now call on these experts at 21 universities and research organisations - including the University of Southampton . Most researchers use software. We’re not talking about word processing, but research software, which is used to generate, process or analyse results. Whether it’s a short Matlab script or a fully-fledged software package, a lot of this software is written by the researchers themselves. We asked researchers at 15 Russell Group universities about their software . Of the 400 respondents, 70% reported that But whilst we investigate how to support better data practices in their research would be impossible without software. This is a general research, we should be aware that software plays an equally important trend: no software, no research. role. After all, without the software to analyse and interpret it, data is There is a bright side: our poor treatment of software means that there just a collection of numbers. are many ways to improve! These range from easy technical changes, Simon Hettrick, like documenting your code or using a version control repository, Deputy Director, Software Sustainability Institute. Aerospace and defence The University is set to showcase its aerospace and defence expertise at the biennial Farnborough International Airshow, taking place this year from 11 to 17 July. Aerospace is a hugely important area for Southampton and we plan to showcase our extensive research at this important event. Undeniably the Airshow provides considerable opportunities to strengthen our industry relationships and present our expertise to the thousands of attendees. A new and exciting initiative this year is the University’s inclusion in the Farnborough flying displays where a Southampton Unmanned Air Vehicle (UAV) will beam live photography onto TV screens across the exhibition halls. Based in the Innovation Zone (Hall 3, Stand 21) our exhibition will focus on three main themes: autonomy, sensors and cyber security. These themes are closely aligned with University plans to secure greater collaboration with the aerospace sector, where key growth areas for investment exist. Emphasising these themes will enable us to showcase the expertise within our strategic research groups for Autonomous Systems and MENSUS (Monitoring of Engineered and Natural Systems Using Sensors) and promote our broader cyber and security capabilities, including the recently established Cyber Security Academy. We also aim to exploit the growing aerospace requirement for optoelectronics technologies, enhanced sustainability, and improved logistic and operational efficiency. Futures Day Futures Day, on Friday 15 July, is one of the highlights of the Airshow calendar when the event opens its doors to over 5,000 younger people. Itâ&#x20AC;&#x2122;s a chance for this audience to see the exciting career opportunities available in the Aerospace and Defence sectors, and participate in a variety of expert talks, educational activities, competitions and group work, all designed to raise awareness of related industries and careers. Central to the day is the Innovation Zone, where students can experience aerospace technology of the future and meet with academic institutions. We will be demonstrating the Universityâ&#x20AC;&#x2122;s Human Flying Wing Suit and showcasing our flight test simulation as part of the PRiME project. Keen to identify and support home grown talent in Hampshire, we have initiated direct contact with Hampshire schools, colleges, universities and youth groups to urge them to visit our stand and take advantage of the opportunities Farnborough presents. With student recruitment a high priority and a new aeronautical electronics degree programme launching shortly, the Airshow provides considerable exposure to industry and prospective students. About SETsquared SETsquared is a long-standing partnership between the universities of Bath, Bristol, Exeter, Southampton and Surrey which specialises in growing high-tech start-ups through its incubation programme and other business acceleration services. SETsquared provides mentoring, access to investors and corporate innovators and a wide range of industry experts through its network and training programmes. Its business incubation programme is ranked by the University Business Incubator Index as the best in the world and over the last decade it has helped over 1,000 high-tech start-ups to develop and raise more than a £1bn of investment. Independent research carried out by Warwick Economics estimates the economic impact of SETsquared member companies to be £3.8bn, with the creation of 9,000 jobs, and that these companies will go on to deliver a further £8.6bn of impact to the UK economy in the decade ahead. For more than 20 years we have been recognised internationally for making a difference through health research. Our unique approach to research management is based on a rigorous commitment to reducing waste. I am immensely proud of who we are, what we stand for, what we achieve and the way we achieve it. 85%* of health research funding could be wasted! Inappropriate design, irrelevant questions, and failing to publish results in full are just some of the ways that can lead to a significant waste of research funding in health. The Wessex Institute, an enterprise unit within the University’s Faculty of Medicine, has pioneered innovative approaches in the way that research funding is managed to add value, increase impact, and minimise avoidable waste. “More than 350 external experts are used to identify research priorities, and over 200 professional staff in Southampton manage funding programmes and disseminate research outputs.” says Dr David Stevenson, Head of Business Development. The Institute manages NHS research funding of around £140 million annually on behalf of the Department of Health and is home to a growing number of nationally important, internationally recognised centres. These include the Southampton Health Technology Assessments Centre (SHTAC), which informs NICE’s appraisal programme; and the National Institute of Health Research (NIHR) Evaluation, Trials and Studies Coordinating Centre (NETSCC), which is the NIHR’s largest research funding centre. The Wessex Institute continues to seek new partners and opportunities to apply its knowledge and methods to increase research impact for the benefit of society. As the largest contributor of consultancy income to the University, it’s exceptionally well placed to do so! The income generated from a selection of these activities is used formulaically to determine the allocation of more than £150 million through the Higher Education Innovation Fund (HEIF) of which the University receives the maximum available of some £3 million annually to support university-business engagement in both faculties and professional services. Dashboards demonstrate harm from alcohol Alcohol-related harm consumes nearly £2.7 billion of the annual NHS budget and cost almost £238 million annually across Dorset, Hampshire and Wiltshire during 2013/2014. undertaken by the network in improving the population’s health, and boosting innovation in the healthcare sector which supports some three million people living across the region. Data intelligence, developed by the University of Southampton, is being used to target changes to services within Wessex NHS Hospital Trusts. Along with a new interactive dashboard, this data is beginning to give a more detailed picture of the state of alcohol treatment across the region. Rising star: radically changing the way we experience audio sound Marcos F. Simón Gálvez, Institute of Sound and Vibration Research, Faculty of Engineering and Environment As an audio scientist I believe that in the near future we will be listening to all possible kinds of audio material in a way that is as close to reality as never before. Picture yourself in your living room watching an action film. Listen to it with 3D audio and you will be able to imagine yourself immersed within the actual film. Marcos is part of an audio research team working with BBC R&D on a radical new listener-centred approach to 3D sound production that can dynamically adapt to the listeners’ environment and location to create a sense of immersion. This will change the way audio is produced and delivered, to enable practical high-quality 3D sound reproduction in everyday spaces. Feature website: ODINE www.opendataincubator.eu The Open Data Incubator for Europe (ODINE) is a six-month incubator for open data entrepreneurs across Europe. The programme is funded with a €7.8m grant from the EU’s Horizon 2020 programme and is delivered by the Open Data Institute (ODI), University of Southampton and six other European partners. Southampton has been at the forefront of research, education and innovation in complex open data ecosystems for over 20 years. ODINE aims to support the next generation of digital businesses and support them to fast-track the development of their products. Start-ups interested in applying for the incubator programme should register by the end of August 2016 via the ODINE website. Media highlights 1. The University’s LifeLab featured on BBC Two’s Horizon in an episode on ‘Why Are We Getting So Fat?’ Watch again here. 2. News that our research found that men still occupy the vast majority of key production roles in the UK film industry was covered by The Guardian, Huffington Post, Waitrose weekend magazine and Screen Daily. 3. News that an international team, led by Southampton, found a potentially viable way to remove carbon dioxide emissions from the atmosphere and turn it into rock, was covered in the Guardian, the Independent, Newsweek, TIME and BBC News. 4. Our experts were part of a team that discovered gravitational ripples in spacetime for the second time in just three months. The news has been covered by the Daily Echo, the Independent and Herald Scotland. 5. As part of the EU-funded STARS4ALL project, a group of our astronomers are organising expeditions to observe and broadcast astronomical phenomena such as the Aurora Borealis. The news was covered by Phys.org and other international outlets. 6. Our collaborative study with the University of Cambridge, revealed strong evidence of a link between serious antisocial behaviour and brain development. The news was covered by The Daily Mail and the Telegraph. The RSE Conference is the first conference to focus exclusively on the issues that affect people who write and use software in research. Attendees will learn about the cutting edge techniques being used in research, pick up new skills, and hear from a broad range of speakers. The MENSUS team will display and host a wide variety of academic and industrial research that is relevant to system condition monitoring. This event is aimed at an audience interested in sensing and monitoring systems for the aerospace, maritime, transport, energy, environment and healthcare sectors. One of Europe’s Most Innovative Universities The University of Southampton has been named in Europe’s top 100 Most Innovative Universities by Thomson Reuters, the world’s largest international multimedia news agency. 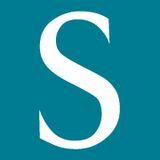 Southampton was ranked 77th, one of 17 UK universities, in Reuters’ first-ever ranking of Europe’s innovative universities. The list identifies the higher educational institutions that are doing the most to advance science, invent new technologies, and help drive the global economy. Dr Francesco Poletti from the Optoelectronics Research Centre (ORC) has won a €2.75 million ERC Consolidator Grant from the EU to support him find transformative ways of increasing information capacity and power delivery capability of optical fibres. The University’s MEng Computer Science with Cyber Security course has received Government accreditation on reaching GCHQ’s standard for cyber security disciplines. The ‘LightPipe’ project aims to develop radically new optical fibres that can keep up with the relentless growth in global data traffic and laser output power, which roughly doubles every two years. European Research Council grants support researchers at the stage where they are consolidating their own independent research team and programme. Being granted an ERC while holding an equally prestigious fellowship from the UK Royal Society is a stunning achievement for someone in the early stages of his career. GCHQ Certified Masters is an integral part of the Government’s newly launched CyberFirst scheme, aimed at encouraging young people into the cyber security profession to support the UK’s national security needs into the future. Underwater drones to transform marine industry risk management Low-cost underwater unmanned autonomous vehicles (UAVs) are to scan the ocean and gather environmental information for management of one of Europe’s busiest ports using ground-breaking technology from European researchers. especially the Laboratório de Sistemas e Tecnologia Subaquática from University of Porto, Portugal. This selection of awards demonstrates the breadth of funding secured by our academics across the University. This list encompasses awards logged with University of Southampton Finance from March - May 2016 that are considered non-commercially sensitive. Research and Innovation Services (R&IS) is a dynamic department at the heart of University activity. We bring together businesses, entrepreneur communities, public bodies and world-leading University research staff and students to deliver internationally excellent research, create new knowledge and solve real-world problems. We offer experience, networks and expertise to help make the right connections between our research community and external organisations and industry. When finished with this document please recycle it. Summer 2016 edition of Re:action, the University of Southampton's Research & Enterprise newsletter.